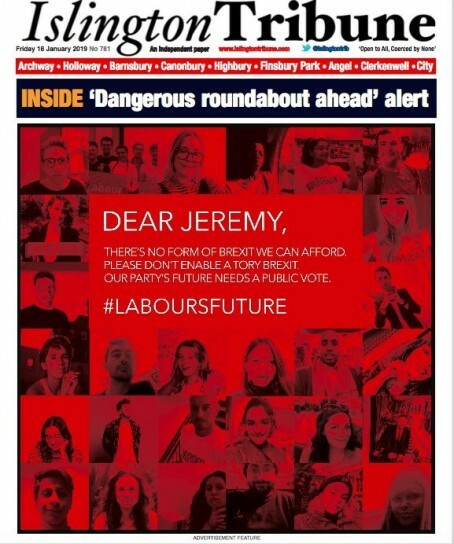 A newspaper serving Jeremy Corbyn’s constituency has published a front page advertisement urging the Labour leader to back a second referendum on European Union membership. The wraparound advert has appeared on the front of this morning’s edition of the Islington Tribune. The ad was taken out by Corbyn-supporting members of anti-Brexit groups, including Our Future Our Choice. Its publication comes at the end of a week in which Prime Minister Theresa May’s government survived a no-confidence vote called by Mr Corbyn after her Brexit deal was voted down by MPs. However, the opposition leader has since refused to take part in negotiations with the PM over Brexit unless a ‘no deal’ option is taken off the table. Cathleen added she placed the advert in the Tribune because it was Mr Corbyn’s local paper and “there was a high chance he would read it”. HTFP has approached the Tribune for a comment.